This shader aims to provide all the parameters needed to achieve a wide variety of looks. The proportion of incoming light reflected back as the diffuse component, from 0 (no diffuse reflection) to 1 (all incoming light is reflected). Non-attenuated lights such as point lights and spot lights may produce brighter pixel values than this value. A floating point value used to control the size or spread of the diffuse component. Higher values make the surface look less glossy with flatter color. When Fresnel Blending is on, controls the minimum amount of reflection that will not be blended with the Fresnel factor. Diffuse components are blended with the transmissive Fresnel component. Fresnel blending of the diffuse component only makes sense when one or both specular reflection layers are on. If there is no specular reflection, you should turn off Fresnel Blending. Use the base color below to color the surface. If Use point colors and/or Use color map are also on, the base color will be multiplied with them. The base color to use for surface shading when Use base color is on. Use values stored in the object geometry’s Cd point attributes to color the surface. If Use base color and/or Use color map are also on, the point color will be multiplied with them. Use color attributes on packed primitives. This is multiplied against the existing diffuse color values. Use a texture map to color the surface. If Use base color and/or Use point colors are also on, the texture color will be multiplied with them. The texture map to use for surface shading when Use color map is on. The blending factor between the base color and the color map, from 0 (base color only) to 1 (fully blend the color map with the base color). Determines what the texture looks like when the texture coordinates are outside of the [0,1] range. Streak means the texture color at the edges is clamped and streaks outside the map. Sets the color outside the texture map to the Border Color. See texture for more information. Type of anti-aliasing filter used. Filter Width is the number of pixels, in both u and v directions, to use in filtering. Light sources (including environment lights) will be reflected. Light source reflections are commonly known as "Specular Highlights". This reflection layer will reflect other objects in the scene, using raytracing. The mathematical model used to simulate glossy reflections. For each viewing angle and surface normal, the model defines from which directions and at what intensity light is reflected. This is what shapes specular highlights and reflections in general. The overall glossiness, and with it the size of highlights, is controlled by Roughness. The available models simulate the effects caused by Roughness with varying degrees of physical accuracy, with GGX currently being the most accurate. The chosen model has no effect when Roughness is 0, since this causes light to be reflected from a single direction at full intensity, making the model irrelevant. See Roughness for more information. The figure below shows the result produced by various specular models across a range of roughness values. Note how rough surfaces look more natural with the GGX model because the interaction of light with the rough surface is modeled more accurately. The proportion of light that is reflected by this specular layer, from 0 (no light reflected) to 1 (all light is reflected). If changing the specular color causes your diffuse color to change, it’s probably because Conserve energy is on. In that case, making the specular color unrealistically bright will require the diffuse color to become darker so the combined energy stays the same. Use a texture map for Intensity. The map to use when Use Map is enabled. The channel to use from the texture map. When Fresnel Blending is enabled, controls the proportion of specular reflection that will not be blended with the Fresnel factor. Increasing this parameter will cause a minimum amount of reflection to appear even for rays perpendicular to the surface. The color to tint reflections with. Use a texture map for the specular color. The texture map to use for the specular color when Use specular map is on. Controls how much of an effect the map has on the end result, from 0 (specular color only) to 1 (fully blend the specular map with the specular color). This is a measure of how bumpy a surface is at the microscopic level. The most obvious effect is that reflections become glossier as Roughness increases. At a value of 0, the surface is perfectly smooth and produces perfect mirror reflections. A value of 1 simulates a very rough surface, which results in very blurry reflections, similar to diffuse reflection. In more accurate Specular Models like GGX, reflections on rough surfaces are also darkened at grazing angles. This is due to Masking-Shadowing effects, where parts of the surface are hidden from view and/or not reached by light due to microscopic grooves and spikes in the surface. Note that this is simulated using a simplified mathematical model, rather than using actual additional geometry. The visual change when transitioning from 0 to 1 is close to linear. Use a texture map to control specular roughness. The texture map used to control specular roughness. Controls which channel to use from the texture map. Causes reflections to be stretched in the direction defined by Anisotropy Direction. This simulates microscopic bumps with a directional bias, causing light to be scattered more in the defined direction. This is typical of brushed metals. The effect of this parameter increases with Roughness. It has no effect at all when Roughness is 0.0. Enables separate roughness, intensity, and color parameters for object reflections, independent of the parameters for specular reflections. This lets you create artistic (physically unrealistic) differences between the object reflections and light reflections. The intensity to use for object reflections, when Separate object reflection parameters is on. This overrides Specular Intensity. A tint color for object reflections, when Separate object reflection parameters is on. This overrides Specular Color. Turns on simulation of light refracting through the object. Light sources (including environment lights) will appear in refractions. Show refractions of objects. You should normally leave this option on (otherwise no refractions will appear) unless you are simulating a single sheet of reflective material, and you still want light to filter through the object. The mathematical model used to simulate glossy refractions. For each viewing angle and surface normal, the model defines from which directions and at what intensity light is refracted. This is what shapes highlights and refractions in general. The overall glossiness, and with it the size of highlights, is controlled by Refraction Roughness. The chosen model has no effect when Refraction Roughness is 0, since this causes light to be refracted from a single direction at full intensity, making the model irrelevant. 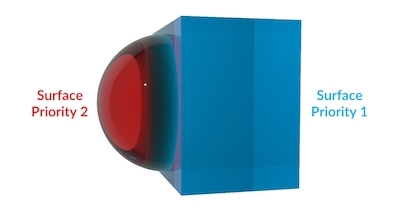 Treat the surface of the shaded object as a thin refractive film rather than the boundary between the outside of the object and a solid interior. Turn this on to simulate hollow and/or thin refractive objects such as bubbles or windows. The node still uses the refractive index to calculate the proportion of reflection and refraction for fresnel blending, but the transmitted ray will not change direction. The shaded surface’s place in an order of precedence for overlapping transparent materials. A value of 0 means the surface priority should be ignored. Surfaces with lower numbers (higher priority) "override" surfaces with higher numbers (lower priority). Mantra will only calculate the shaders for the highest priority object in a given area, creating the effect of higher priority objects overriding and removing lower priority objects in the same overlapping space. 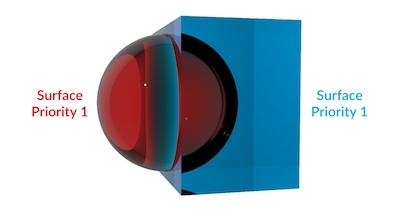 In this render, the red sphere and the blue box have the same surface priority. This causes problems with refraction and absorption, because it’s not clear to Mantra which surface is inside or outside. In this example, the red sphere has a higher priority than the blue box (lower numbers mena higher priority) so it "carves out" its volume from the box (Mantra simply ignores whichever parts of the box have overlapped the sphere). The absorption and refraction is now correct for the red sphere being embedded in the blue box. This setup would work well for something like ice cubes floating in water. In this example, the surface priority values are switched so the blue box has higher priority. This has the effect of removing any parts of the red sphere which overlapped the blue box. This setup would work for something like water droplets resting on the surface of a glass. This parameter only takes effect when Enable Absorption and Nested Dielectrics is turned on in the Mantra render node. The proportion of light refracted by the surface, from 0 (no light refracted) to 1 (all incoming light is refracted). When Fresnel Blending is on, controls the proportion of refraction that will not be blended with the Fresnel factor. Increasing this parameter will cause a minimum amount of refraction to appear even for rays that graze the surface (and so would normally not refract). A tint for the refracted light (technically, the refraction amount for different color components). For example, setting the refraction color to 1, 0, 0 will cause the surface to refract only red light. Roughness is a measure of how bumpy a surface is at the microscopic level. The most obvious effect is that refractions become glossier as roughness increases. At a value of 0, the surface is perfectly smooth and produces perfect refractions like glass. A value of 1 simulates a very rough surface, which results in very blurry refractions, like milky glass. The visual change when transitioning from 0 to 1 should be close to linear. The direction and amount of anisotropy in the refraction. Values less than 0 will sharpen the refraction in the U direction while values larger than 0 will sharpen the refraction in the V direction. When the Refraction Anisotropy is -1 or 1, refractions will have a width of 0 in the other direction. Spreads and colors refraction rays to simulate the effect of a spectrum of wavelengths within the refracted light. The larger this value, the larger the spectral separation. When this parameter is set to a non-zero value, refracted rays are tagged with a single wavelength in the visible spectrum. Each of these wavelengths modify the underlying index of refraction (IOR) causing the rays to separate as they travel through the refractive material. Tint rays with this color as they pass through an object. The amount of tinting depends on the distance a light ray travels within the object. You can scale the tinting using At distance. A ray must travel this distance within the object before it is completely colored by the Transmission color. Shorter distances give less tinting, longer distances give a darker and more saturated version of the Transmission Color. Colors that are not fully saturated work best with the At Distance parameter. Color components that are set to 0.0 aren’t absorbed at all, while components set to 1.0 are fully absorbed. This means that At Distance has no effect on those components. Simulate subsurface scattering of light through the object. The overall proportion of light that is scattered, from 0 (no scattering) to 1 (all light is scattered). Higher subsurface albedo values will produce more multiple scattering and a greater scattering distance. Controls the nature of the scattering. Positive values give forward scattering, 0 gives isotropic scattering, and negative values give backscattering. Range is -1 (full backscattering) to 1 (full forward scattering). The value depends on the type of material you are trying to model. For example, skin is highly forward scattering, while marble is backscattering. Enable/disable contribution from light that scatters exactly once in the surface. Certain types of surfaces (such as skin) gain little contribution from single scattering and so disabling this option will reduce computation time with little impact on accuracy. A scaling factor for the contribution of single scattering to the surface color, from 0 (no contribution) to 1 (full contribution). The number of samples for single scattering. Increase this option to decrease noise at the expense of slower shading. Enable contribution from light that scatters more than once in the surface. For low albedo materials (low Subsurface Albedo), multiple scattering contributes little to the image and can be disabled to reduce computation time. Controls the way in which multiple scattering is computed. Normally you should use the Local And Global mode if you are planning to use a point cloud, and Ray Tracing to compute multiple scattering without a point cloud. Using a point cloud can produce smoother and faster results, but it requires precomputation of a point cloud and computation of irradiance for each point in the cloud (once per render). Use ray tracing rather than a point cloud to approximate multiple scattering. This option avoids point cloud calculations but may require more sampling to eliminate noise. When an single object is made of multiple packed primitives (i.e. multiple Alembic shape nodes), each shape will have local multiple scattering. With Full Ray Traced, all individual packed primitives will be considered when computing multiple scattering. Only use a BRDF function to compute the multiple scattering contribution. This is the fastest option, though no subsurface diffusion will be produced. Use a point cloud to compute the multiple scattering contribution. This option requires a precomputation stage to generate the point cloud and to calculate and cache the surface irradiance values in the point cloud. Use the BRDF function to compute the local contribution and the point cloud to compute the global contribution, with the Local Radius Scale parameter controlling the local radius. This option will usually produce more accurate results than using a point cloud alone, especially for short scattering distances. Simulate subsurface scattering by path tracing through it as a volume. This options is slow and noisy but will produce the most accurate results - so it may be used to produce ground truth images for comparison with the other techniques. Controls how the shader generates a point cloud. The simplest option is to select Generate At Render Time. This will create a new point cloud for every render. To reduce computation time, you can first use Write To File mode and then re-use the point cloud using Read From File mode on subsequent renders. This is also the recommended approach when rendering animations because the shader will smoothly interpolate the point cloud across frames. The exception to this is when the model’s topology changes (two joined polygons are separated, for example). In this case, a new point cloud must be generated. Note that in Write To File mode, the file will be overwritten if it already exists. Cancelling a render before it completes in Write To File mode may result in an unusable point cloud file. See managing point clouds for more information. Always regenerate the point cloud whenever the node renders. This is convenient since you don’t have to worry about file management, and can be useful when you are modifying the shader and model at the same time. However, for efficiency you should cache the point cloud, especially when rendering animation. Read the point cloud from a file (specified in the Point Cloud parameter below), generated using the Write To File mode. Write the point cloud to the file specified in the Point Cloud parameter below. Controls the file the point cloud is written to/read from when Point Cloud Mode is Write To File or Read From File. The point cloud is based on surface UVs, so it is not necessary to write a new point cloud file for each frame unless the topology of the model is changes. A scaling factor for the contribution of multiple scattering to the surface color, from 0 (no contribution) to 1 (full contribution). Controls the number of samples in the point cloud. Low values give fast renders but a sharper, less accurate look. High values give slower renders but a blurrier, more accurate look. The dominant color in lit areas of the surface. Use a texture map to tint the rays entering the surface. The texture map to use when Use subsurface map is on. The blending factor between the original color of the rays and the subsurface map, from 0 (original color only) to 1 (fully blend the subsurface map with the ray color). How quickly the light intensity decreases as it scatters. Higher values make the lighting level decrease faster. Available when Parameter mode is Artist. Use a texture map for the attenuation color. The texture map to use when Use Map is on. The blending factor between the Attenuation color and the Attenuation map, from 0 (attenuation color only) to 1 (fully blend the attenuation map with the attenuation color). Add a constant amount of diffuse light emitted from the surface. For example, with emission on, the object would be visible in the render even if none of the light objects were shining on it. This may be useful in some circumstances, but normally you should simply use an Area Light to add light to the scene more efficiently and controllably, especially if you need to add a lot of light. The light emitted by this object will brighten the surfaces of other objects. When this option is off, the emitted light will be visible in the camera, but will not fall on other objects in the scene. Use a texture map for the emission color. The amount of influence the map has on the final color. Opacity controls how transparent the object is in the scene (that is, how visible are things behind the object in the scene). Alpha controls the alpha channel of the rendered image (that is, how transparent are the pixels in the rendered image corresponding to the shaded surface). Scales the value of the Opacity parameter. This is useful as a single number to manipulate rather than having to change all three components of the Opacity parameter together. The opacity of the red, green, and blue channels of the shaded surface color. Use a texture map to control the opacity of the shaded surface color. The texture to use for surface color opacity when Use Map is on. The blending factor between the Opacity color and the Opacity map, from 0 (opacity color only) to 1 (fully blend the opacity map with the opacity color). Blend between different opacities for parts of the surface that are perpendicular (head-on) to the camera and parts that are parallel (edge-on). The opacity to use for rays that are parallel to the surface normal, when Enable opacity falloff is on. The opacity to use for rays that are perpendicular to the surface normal (rays that graze the surface), when Enable opacity falloff is on. Controls the blending point between parallel and perpendicular opacity. Values larger than 1 give more parallel opacity, values smaller than 1 give more perpendicular opacity. Transmissive objects produce semi-transparent shadows that attempt to approximate the amount of light that would be transmitted if real caustics were rendered. If you're rendering real caustics using an Indirect Light, turn this parameter off. The minimum shadow intensity to use for fake caustics. Increase this to darken the lightest part of the shadow. The maximum shadow intensity to use for fake caustics. Decrease this to lighten the darkest part of the shadow. Automatically flip normals if necessary so planal surfaces are diffuse shaded the same way regardless of normal direction. This setting does not apply to refractions and Fresnel reflections since they rely on the normal direction to define inside and outside for Fresnel blending. If normal maps exported from another software package look strange with this option on, it may be because the normal map was output with flipped normals. Ensures that the surface reflects no more light than it receives. This is important in physically based rendering and raytracing to ensure the illumination in the scene does not increase as the number of raytracing bounces increases. For example, a surface that reflects twice as much light as it receives (by turning off Conserve Energy and setting the Specular Intensity to 2) would produce a unnaturally bright render as you increase the Reflect Limit. This setting conserves energy by scaling the BSDF by the inverse of its reflectivity when the node detects the reflectivity is greather than 1. This reduces all components of the surface model by the same factor, linearly darkening of the surface. You can calculate the total reflectivity of a surface (assuming Fresnel Blending is off) by summing the Diffuse Intensity, Specular Intensity (for each layer) and Refraction Intensity. For predictable results, you should try to conserve energy manually by limiting the intensity or reflectivity parameters. The interior index of refraction for use in physical Fresnel computations. Water has an index of refraction around 1.33. The exterior index of refraction for use in physical Fresnel computations. Air has an index of refraction near 1. Turns on Fresnel blending, where the reflection and/or refraction amount varies based on the viewing angle to the surface. This allows you to simulate materials such as glass and water. You can control the proportion of Fresnel blending for each component through the "minimum" parameters on the different tabs (for example, Diffuse Minimum on the Diffuse tab). Diffuse and Refract components use the transmissive component for Fresnel blending, while Reflect components use the reflective component. Choose whether to output normals that have been modified by the shader, or output a difference between a high res and low res geometry. Output normals that have been modified by the shader. Output normals in the space of the low res geometry using the high resolution geometry. Specify a low-res geometry using the UV Render Object render property on the render node. Both objects must be visible. This will lookup the normals from the high-res geometry and output them in the low-res geometry space. When using "Geometry Different" with a high res and low res object, you should use a Peak SOP to prevent inter-penetrations artifacts in the normal map. The coordinate system in which to output the normals. Use tangent space for deforming objects, so the normals stay relative to the moving surface. Some target applications might require a certain space for tangent maps. Commonly, game engines and other real time systems use tangent space maps. Map the normal data into specific range. Either -1 to 1 or 0 to 1. Use a texture map to displace the surface of the object at render time. Use a noise function to displace the surface of the object at render time. The controls on this tab let you apply a displacement map and/or a bump map to the shaded surface. You do not need to set up your own "displacement bounds" render properties when doing displacement. This material automatically sets the displacement bounds. The scaling factor for values in the displacement textures. This depends on the scale of the scene, but will usually be very small. For example, if the scaling factor was 1.0, a value of 1 in the map would cause a displacement of 1 Houdini length unit. The maximum bounds that the displacement shader will move geometry. This is defined in "camera" space. The absolute value is used to determine the bounds. Whether to do "real" displacement (actually modify geometry at render time, allowing the silhouette of the object to change). If you turn this option off, the values of the displacement tab will be used as a bump map (creating the appearance of depth but not actually modifying the geometry or changing the object’s silhouette). The texture to use for displacing the surface. The channel of the texture image to use as the displacement value. If set to XYZ Displace, the RGB channels will be treated as absolute displacements in object space. This is useful for displacing the maps created by the Ocean Evaluate SOP. Usually a scaling factor of 1 should be used in this case and the displacement bound set to the maximum wave height. Different types of noise have different characteristics. Perlin is the standard noise. Original Perlin is similar to Perlin noise, but marginally slower to compute and with different characteristics. Sparse convolution is slower to computer and looks more random. Alligator noise is slower to computer and a very different, more cellular look from the other noise types. The scale of the noise pattern. Larger values give smaller, but not more detailed patterns. Positions the noise in X, Y, and Z.
Scales the output of the noise function. Sharpens or softens the edges of the noise. Lower values are softer, higher values sharper. Shifts the median value of the noise. Values greater than 1 dampen the noise down, while values less than 1 sharpen the contrast between noise values. Controls the amount of detail in the noise. This is the number of times the noise function is called and summed. If the Frequency is high, there is no need for much detail, 1 or 2 should be plenty. This can affect the Amplitude of the noise as well since the summing will result in higher base values. When enabled, averages normals around the specified radius (in Houdini units). This can be useful to fake beveled edges on hard surfaces. A normal map directly sets the surface normals. A bump map modifies the displaced normals. Set to "None" to not modify the normals. Use a texture map for bump mapping. A scaling factor for the values in the bump texture. The texture to use for the bump map, when Map type is "Bump". Use a texture map for normal mapping. The texture map to use for normal mapping. The example images above use HDRIs from hdrihaven.com.